It’s one of those things were you really want to like something that you know you shouldn’t, but continually bump your head against the wall trying to make it work. I have flip-flopped over this review for the past couple of months. 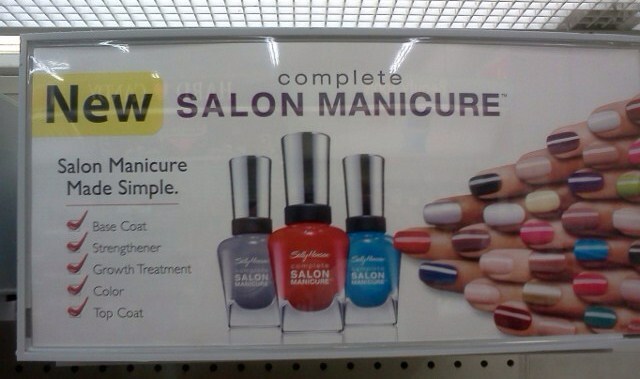 I know it’s just nail polish, but I’m just torn and confused by this product. I’m having such ambivalent feelings about it, and I’m not sure that I have resolved them. I first purchased this product back in July, and had my mind made up about it within a day. I decided to revisit it a few months later and try to be more open-minded, and my mind did change a bit. With Vita-Care Technology for advanced wear, more shine, and nourishing care. In my opinion that sounds like the perfect nail polish since it has everything you need (and then some) incorporated into it. However, I also think that’s it’s downfall. I think that it is trying to do too much, and in the end you get a mediocre polish that doesn’t live up to it’s name. The color I purchased this product in is called Calypso Blue. This was not the look I was going for..
One of the most aggravating things to deal with when I’m putting on nail polish and really makes me feel like grrr is when I’m checking out my freshly done nail and see those tiny (or big) bubbles all over them. I hate having to redo my nails because of it! Especially when I’m trying to do something “fancy” with them and it’s actually turning out nice, and I have to start over a billion times (case in point). A couple of months ago I was all ready to do a product review and just destroy the nail polish manufacturer. No matter how many times I applied and reapplied their polish, I kept getting bubbly nails. I eventually gave up and went to another brand, yet the same irritating thing happened. I came to the conclusion that perhaps it wasn’t the polish that was the problem, but me. Now I do know that some nail polish brands are just raggedy like that. I also know that you should make sure that each layer is fully dry before applying the next. Even so, I was still getting those horrific bubbles. I couldn’t pinpoint what I was doing to cause them, so looked it up. A quick search revealed the culprits. Roll, don’t shake your polish before using. Apply thin layers, not thick ones. Allow each layer to fully dry before applying the next. My problems were the shaking and thick layers. I’ve always been a shaker and applying thick layers was my standard cause one dip into polish was never enough for my long nails. What that left me with was colorfully bumpy nails that you could read like braille. It’s a vibrant royal blue. It has minute splashes of sparkle that makes it almost iridescent. It’s Essie Aruba Blue and it’s poppin’ folks. I saw it and had to have it. 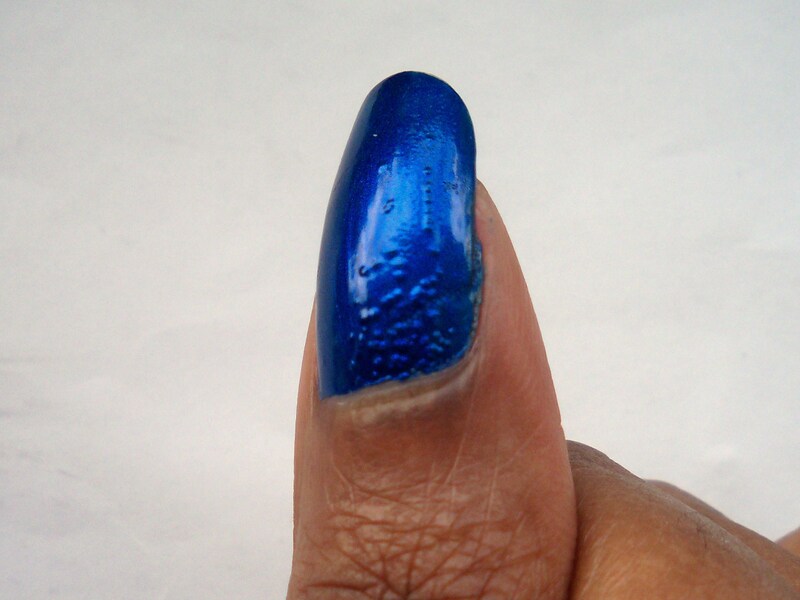 When I started my most recent hunt for blue nail polishes, this is exactly what I had in mind. 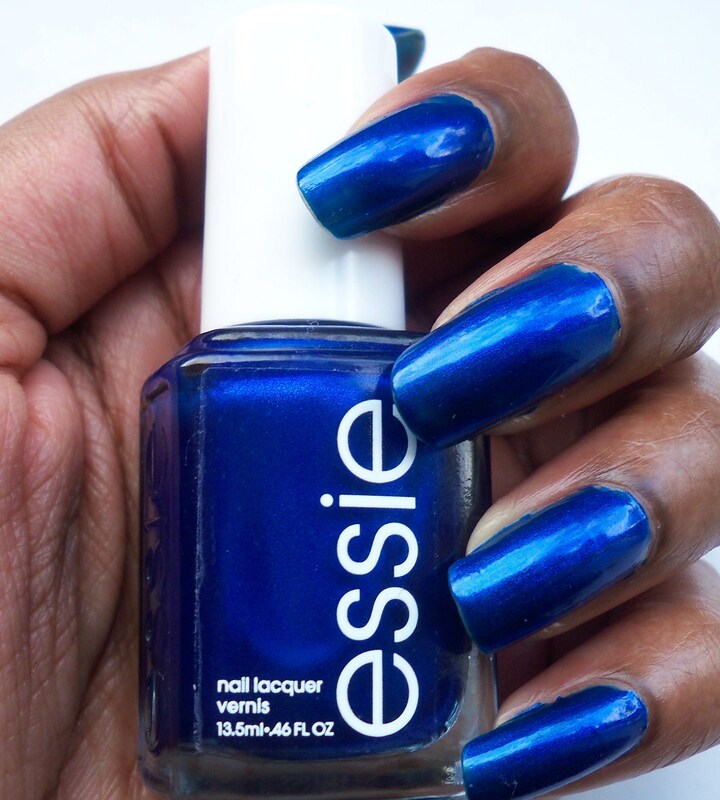 So this week I am dedicating Essie Aruba Blue as the Poppin’ Nail Color of the Week. The past week or so I’ve been all about glittery/sparkly french manicure looks. It’s not a novel idea, but it is for my nails and I’m kinda loving it. It didn’t start out as a glittery venture though. My nails had grown out a little bit when I first began playing around with the whole french manicure look. 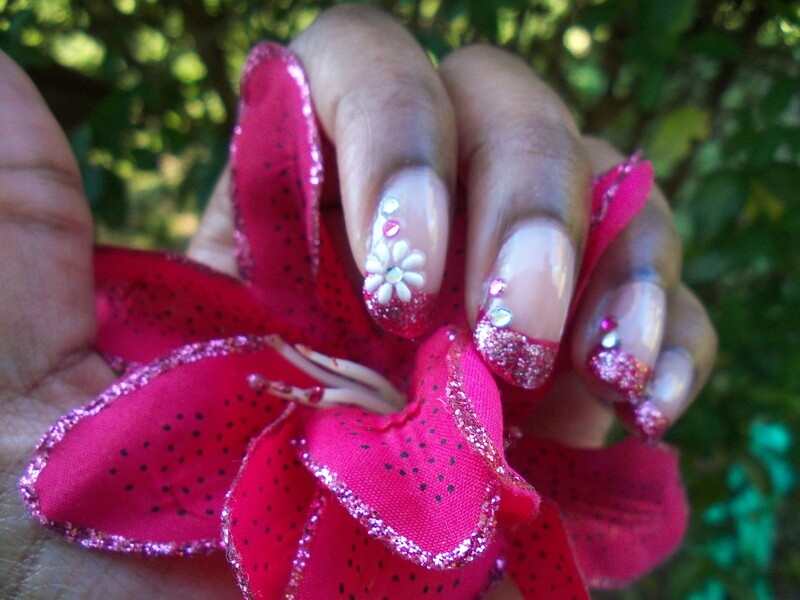 I liked it, but since I have a tendency to throw glitter nail polish on top of EVERY new nail look I try, I added it. Usually it’s a mistake, but this time when I broke out the glitter polish, I actually liked it. Never heard of them, until I saw this article on Cocoandcreme. You gotta check this out. Not sure if it’s for me, but it does look pretty cool. A while back I mentioned that the Kardashians were coming out with a nail polish line with O.P.I., and here it is. I didn’t realize that it would practically be the whole flipppin’ clan though! The picture cut off the last two sisters, but it’s from the mom all the way down and they all have their own little nail colors. 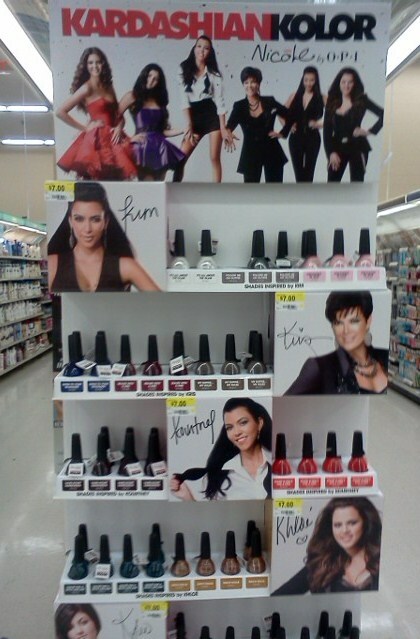 I’m not a fan of the Kardashians (especially lately) so I don’t think I will be purchasing. However, I did see some colors that I would totally buy. Maybe I can find some dupes. Out of all six, I think I like Kim’s the best. 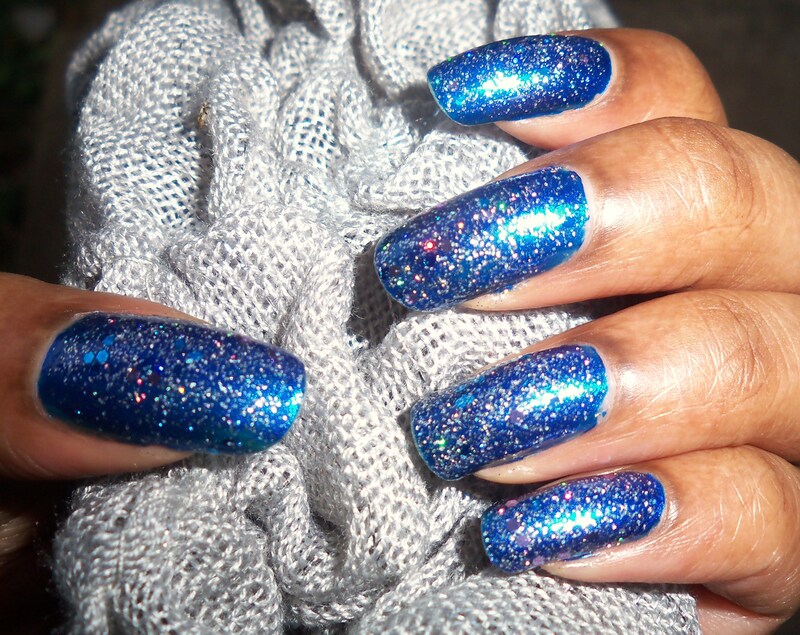 Her colors are all staple nail polishes with hints of glitter or shimmer. My least two favorites are from Kourtney and Kris. Totally blah. I didn’t get close up pics of all the kollection (see what I did there). You can check out the whole line here, but here are the ones that I would buy, if I chose to support them.